Many people doing tourism around Le Marais go to rue des Rosiers to eat a falafel sandwich. Those are good, but the place is overcrowded and one has to queue for a long time just to eat a sandwich on the street. 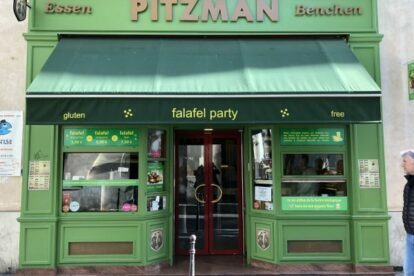 If you would like to taste real Jewish sandwiches and dishes in Paris, I recommend Pitzman, not far away from the main street for that purpose. This small restaurant boasts smells and flavours from Eastern Europe and Middle East. You can eat the famous falafel balls here, with all the condiments and sauces that go with them. It is really a tasty and filling experience, and I recommend sitting inside rather than walking in the street with the sandwich in your hands. The place is in the middle of the Jewish quarter and totally authentic — you will cross paths with the students of the nearby Bible school or people coming from the synagogue next door. Bear in mind that in observance of the Sabbath, the place is closed from Friday at 14:00 till the end of Saturday.